This is Part 2 of a three part series. If you missed it, Check Out Part 1 Here. Feel free to read them in any order. 6. LOOK when your arms go back, just before you jump. Early in my beach volleyball career, hours and hours of watching Olympic Gold Medalist, Todd Rogers, taught me this concept. Today, the guys to watch are Bruno Oscar Schmidt (also a Gold Medalist) from Brazil and Casey Patterson. Those guys get good, fast looks before they jump. To explain the concept, we have to step back and go over some basics. The order of your approach steps should be “Right….. Left… RIGHTLEFT” for right handed players. You should also have a big double arm lift which gets both of your arms firing back behind your head so they can generate lift when the come forward. Check out Andrew Dentler of Mobile Beach Coach below. 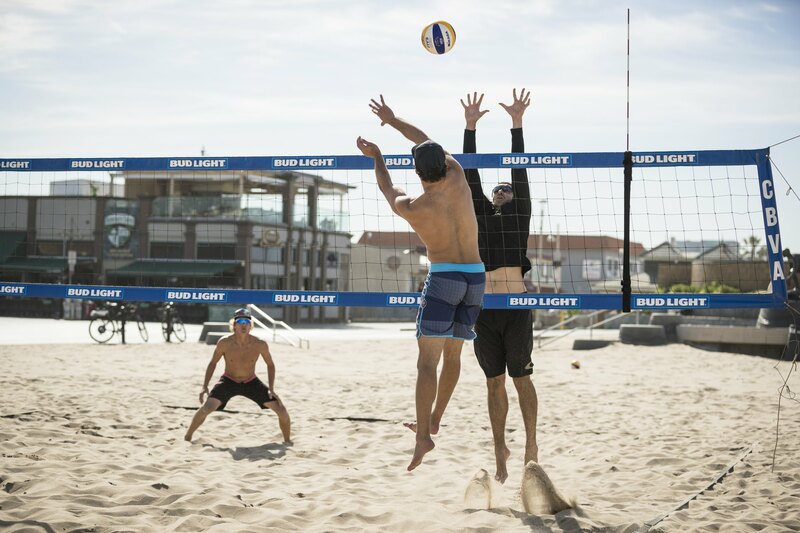 At VolleyCamp Hermosa we train the sequence, “Right, Left, LOOK Left.” On your STEP-close, when your arms have fired back, your eyes should glance forward into the court. Just before you jump, this snap shot of the court should give you an idea of the open spaces and any defensive movement. If you are only looking up at the ball, you will not have any idea where the defender is and any shot you hit is merely a guess. If you shoot the ball without truly seeing the defender first, it’s not a good shot. It’s just a shot in the dark. PRO TIP: Make sure you don’t concern yourself with looking too long. That mistake causes you to slow down too much and become indecisive. It will prevent you from being explosive and hitting at the peak of your jump. Get your look. Be confident in the choice. ACCELERATE the ball to the open space. 7. All of your volleyball spikes should be snappy, not long. Quick contact on your shots makes it harder for the defender to get a beat on the ball. It also makes the time from initial contact to the ground significantly shorter. We are talking about milliseconds but THAT IS THE DIFFERENCE between a kill and something that gets dug. When you visualize shooting high line or hitting cut shots, don’t imagine a slow, soft arm swing. That’s a mistake I made for too long. Instead, think short, quick contact. Your decision should be made on your way up and once it’s made, your goal should be to get the ball from your hand to the ground as quickly as possible. Think about when you were a kid choreographing a sword fight. You made the strikes, long and slow so that your playmate had the opportunity to block them. The same concept applies to your shots. If you create a long, soft movement, defenders and blockers both have the opportunity to get early reads. Quick and snappy is the way to win. 8. Make every shot except the jumbo as FLAT OR DOWN as possible. alize that not all of us are Ryan Doherty and can make this an actuality. BUT, if we all played mindfully and understood that LOOP GIVES DEFENDERS MORE TIME, we would make the change and all be getting dug less. Find the shot that has zero or at least minimal upward trajectory. Likewise, if you have the height and ability to hit a power spike down in the front two thirds of the court, then your cut shot should have complete downward trajectory as well. When the ball doesn’t have to spent time going UP before it goes down, the defender has less time to react and you can still hit the deep corner with pace. PRO TIP: Understand that the velocity, trajectory and success ratio of your cut shots change drastically depending on where you are attacking from. If you are off the net, you can’t hit as steep. If you are attacking from middle, your cutty won’t be as sharp because, you can’t accelerate it in the court with the same speed as you can from the pin. 9. Learn how to deal with bigger blockers. You will come up against some bigger blockers and these goons present some problems for us little guys. When the blocker can out jump you, there are several ways to get it over them. Shoot higher. This is isn’t ideal if they have a capable defender behind them. SET OFF THE NET. Ask your setter to keep you further from the net so you can put some flatter pace on the line shot. Some of the biggest beatdowns, I’ve suffered through against guys like Stafford Slick and Jeremy Casebeer were results of tight but seemingly hittable sets. The closer the blocker is to you, the more angles they take away. Give yourself some space and you’ll have more options. The bonus of this strategy is that it might tempt the blocker to peel in which case you might have more space and a nice target if they aren’t comfortable making overhand digs. Most players aren’t 😉 They can be a force at the net but an absolute liability on the ground. Would you let your center play point guard in basketball? I stole this tip from Casey Jennings a few years back and I got so comfortable that now I prefer all of my sets at minimum 4 feet from the net. Hit the ball VERY early in your jump to beat or tool the block before they get max height. Nick Lucena has the ability and the experience at a mere 6’1″ to cut down 7ft trees. 10. Stop over complicating with thumb up, thumb down. First, SIMPLIFY THE MOVEMENT. I’ll surely catch some flak for this tip but in my experience it’s going to be important to find a MIDDLE ground between what’s traditionally taught and what’s necessary for getting points in the moment. I had this growing pain in a bad way. For years, I tried to drastically wrap my hand around the ball for shots. I would practice my standing cut shots by contorting my wrist, trying to take tiny slices of the ball and creating tons of spin to make a cut shot fall. I would never face the direction of my cut shot because I thought it needed to be SOOOOOO deceptive. Remember this as a right-handed left sider: YOU SHOULD BE FACING DEAD ON THAT ANGLE. Ageless Wonder, John Hyden performs hits a cut shot. Note the contact point on the ball! The real secret is to just put it where it needs to go. If you watch and study John Hyden, you’ll see a player who literally SLAPS the ball around the court. He doesn’t bend balls or use tons of rotating wristy shots. In some cases, he even intentionally hits a spatch ball (a hybrid between topspin and sloat that doesn’t have a predictable flight path) to put even more pressure on the defense. Here’s your key: Treat it like a game of billiards. Hit the ball on the opposite face of where it needs to go and it will go there. Don’t worry about carving the ball or adding spinny wristy movements. Your wrist will have to rotate to accomplish this in the long run but do your best to simplify and mentally release the idea of maximum arm velocity and spin. If this concept isn’t totally clear, shoot a message to [email protected] and we’ll find a way to clarify it. If you are hitting from the left, just hit on top of the ball but with less force. If you are hitting from the right just stay on the top half of the ball and put it down. There IS a time for turning and rotating your wrist to get sharper angles out of less than ideal hitting positions but please, practice the simple movements first. I spent a lot of time training with and against Chaim Schalk this year. He also has some of the simplest cut shots in beach volleyball. Watch him up close and you’ll see that he just needs to get on top of the ball and his cut shots have almost zero side or corner spin. Any player who even comes close to top ten in the world is a good person to learn from and he LIVED there for some time.